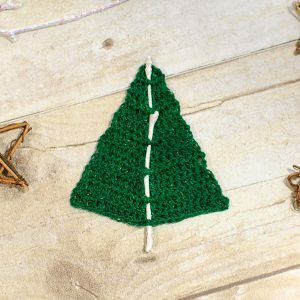 This Woodland Christmas Tree crochet pattern stitches up quickly and makes a wonderfully whimsical little tree to add to your decor, hang on your tree, or even pin to a lapel. 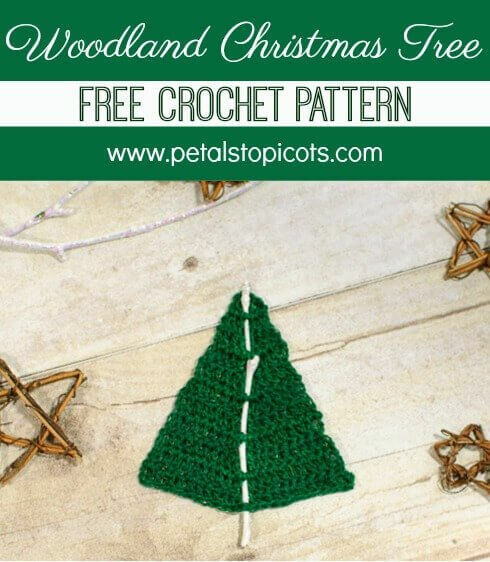 Best of all, you can work up this Woodland Christmas Tree crochet pattern in any weight yarn you have on hand and crochet it to any size you desire! 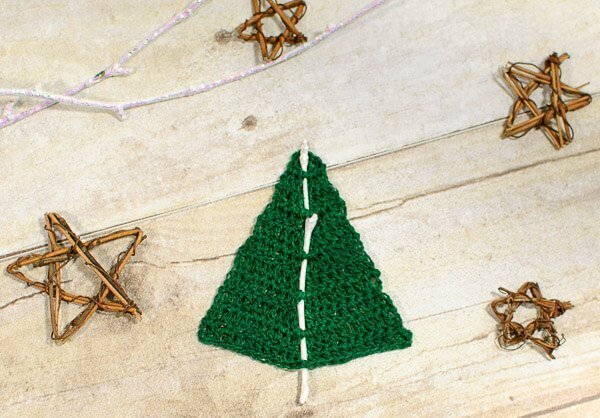 I’ve included the supplies and directions here to make this lace version shown, but I’ve worked up a larger one in worsted weight yarn following this same pattern and am working on another with T-shirt yarn … so fun! Finished size as written is 3 in. tall x 3 in. wide, not including the twig. 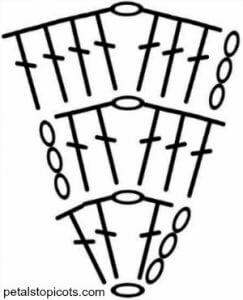 Row 1: Work 1 dc in furthest ch from hook (skipped chains count as dc), ch 1, 2 dc in same ch, turn – 4 dc. Stick the top of the twig through the ch-1 sp. Row 2: Ch 3 (counts as dc here and throughout), work 1 dc in next st, 1 dc in ch-1 sp, working in front of stick, ch 1 and work 1 dc in same ch-sp as last dc, 1 dc in remaining 2 sts, turn – 6 dc. Row 3: Ch 3, work 1 dc in each of the next 2 sts, 1 dc in ch-1 sp, working in front of stick, ch 1 and work 1 dc in same ch-sp as last dc, 1 dc in remaining 4 sts, turn – 8 dc. Row 4: Ch 3, work 1 dc in each st to center, 1 dc in ch-1 sp, working in front of stick, ch 1 and work 1 dc in same ch-sp as last dc, 1 dc in remaining sts, turn – 10 dc. Row 5: Repeat Row 4 until your desired height is reached – each additional row will increase by 2 sts. Pin to shape and block with fabric stiffener.